Did you know that approximately 40,000 search queries are being typed into Google every second? Which means there are about 3.5 billion search queries per day, which translates to over 1 trillion searches a year. Search Engine Optimization is hard enough as is, with frequent changes in rules, algorithm modifications and competitors altering their SEO to upend the search results pages. To make things a little more interesting, on Long Island, SEO has its own unique set of challenges. Although there are a myriad of things that can make successful SEO difficult for local businesses, it can also present opportunities to reach more customers and stand out in search results. The most common way users search is no different than anywhere else in the USA. When searching for a plumber, most users will type in “plumber” or “plumber near me”. In this search Google will ascertain where the searcher is located, and deliver results from nearby businesses. The big difference for Long Island is that customers frequently add the words “Long Island” to their searches. For example, customers looking for basement waterproofing might search “Basement Waterproofing Long Island” or “Long Island HVAC” – and in each case Google treats this much differently than just a “Basement Waterproofing” search. This “Long Island” search acts differently than other searches, which presents a big opportunity for Long Island based businesses. Instead of searching immediately nearby, Google treats the search very literally and often returns search results that show the whole island—from Queens to Montauk (see below). In these search results Google evaluates a number of different factors to decide what to show on the first page. 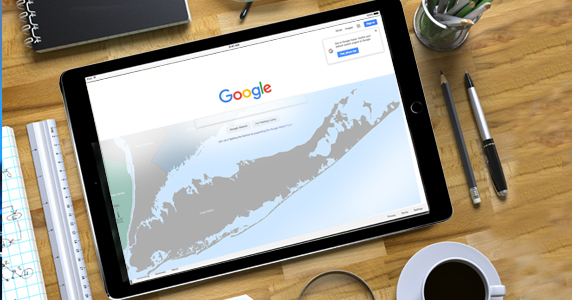 Because of the way Google treats this search, businesses have an opportunity to improve their traffic from search queries for Long Island. We have searched the Internet and found some of the best tips for your site. If people are going to use the term “Long Island” in their search query, Google will look at websites to determine which ones are the most relevant for “Long Island”. In order to have your site considered for these relevant searches, you must include keyword-rich text on pages, in page titles, as well as in meta descriptions which is the HTML code that describes each page. To help Google understand your business, include “Long Island” and other similar phrases throughout your website in meta tags, body text, blog post titles and more. Backlinking can have a positive impact on your site’s search engine results. But wait, what exactly is backlinking? It is when an external website links to another, and vice versa. Essentially, it’s one site vouching for another and when many sites link to the same webpage, this tells the search engine that whatever content is on this site is worth linking to. So if Google sees links from other Long Island businesses that point to your site, that is a strong cue that your business is relevant for that particular “Long Island” search. You can seek links from local businesses by becoming a sponsor of a 5K, participating in charity events, and being mentioned in local newspapers, just to name a few. Understand your audience and learn exactly what they’re searching for. Once you have this figured out, cater to those needs and feed them content that is relevant to them. What is it about air conditioning, plumbing, or healthcare that makes it unique to Long Island? What are common Long Island issues that you have to deal with that might not ring true in other parts of the country? Take advantage of this and create something relevant and informative. It may seem obvious but often times, it’s a missed opportunity. Whether you’re located on Long Island or in California, create a mobile-friendly site. This one is kind of a given but you would be surprised as to how many sites out there that haven’t adjusted yet. It’s all about giving users a positive experience. If a new visitor comes to your site for the first time, you want to make an excellent first impression so be sure your site is compliant with all types of smart phones and tablets and that your images, videos, copy and other content are organized and strategically placed. One bad experience and that user will not likely come back. These tips should be fairly easy to implement but remember to constantly monitor your SEO as algorithms and other factors are continually changing. Whether B2B or direct to consumer, just a few small changes to your site can make a big difference in your search rankings.